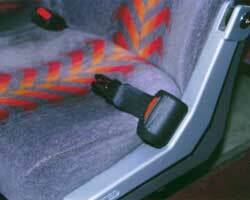 This page links to the most suitable Securon Seat Belts for Minibuses and Coaches. Use the links to view the specification and outline drawing of the Part No. 215E Static Lap Belt with loop on each end which can quickly be secured to the seat frame without bolts. Buckle on webbing. 5051/SL22 Lap and Diagonal Seat Belt with Emergency Locking Retractor (ELR) which mounts vertically. Includes webbing guide for top of seat. Alternative buckles are available. 5051S/SL22 Lap and Diagonal Seat Belt with Emergency Locking Retractor (ELR) which mounts vertically. Includes wire guide loop for top of seat. Alternative buckles are available. 507/SL22 Lap and Diagonal Seat Belt with Emergency Locking Retractor (ELR) which mounts horizontally (under seat). Includes webbing guide for top of seat. Alternative buckles are available. 507S/SL22 Lap and Diagonal Seat Belt with Emergency Locking Retractor (ELR) which mounts horizontally (under seat). Includes wire guide loop for top of seat. Alternative buckles are available.